Polygon - 8/10 - "Taken as a whole, NBA 2K17 is a worthy if subtle upgrade". 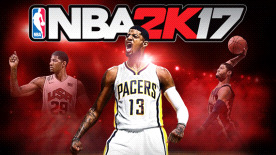 Forbes - 9.1/10 - "NBA 2K's depth continues to set the bar for the Genre." The new NBA game is here, NBA 2K17 might not be a Spike Lee joint, neither can you become the hoop gawd, but the core of the game remains. This realistic NBA simulation gives you some of the best-looking graphics in modern gaming, and not only that, but you can also customise your own players as well as play as leading NBA teams! Other improvements to the game include changes to the MyGM mode, where you can manage an NBA team and participate in off-season events. This fully featured mode is coupled with the MyLeague draft! Another brand-new feature is also the ability to play as Olympic teams such as the US Olympic Basketball team and much more! LEGAL: © 2005-2016 Take-Two Interactive Software and its subsidiaries. All rights reserved. 2K, the 2K logo, and Take-Two Interactive Software are all trademarks and/or registered trademarks of Take-Two Interactive Software, Inc. The NBA and NBA member team identifications are the intellectual property of NBA Properties, Inc. and the respective NBA member teams. © 2016 NBA Properties, Inc. All Rights Reserved.